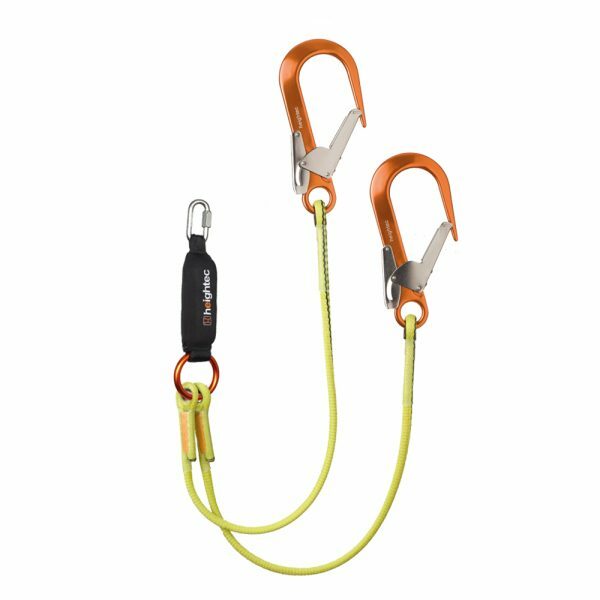 Twin energy absorbing fall arrest lanyards with scaffold hooks for continuous attachment. High specification ELITE twin lanyard with integral suspension intolerance relief footloop. Deploys automatically providing support for both feet. Allows continuous connection to a ladder or structure when climbing masts and towers. The lanyard also includes scaffold hook terminations. The heightec ELITE twin lanyard is a premium product offering advanced safety features. Heatshrunk absorber with replacement cover, tamper evident but with increased durability. Replacement absorber covers available to purchase separately. Absorber will not deploy at force less than 200 kg. Minimum strength 1500 kg after deployment. Patented HELIX™ ropes allow high degree of twist in lanyard legs minimising kinking which occurs with normal kermantel rope versions. Large central ring provides parking point for unused leg and prevents issues caused by 3 way loading. Unique serial ID number allows easy management of equipment. Approved for users up to 140 kg. NB: specifications and colour may change without notice.